Fortress Of Freedom Board :: View topic - The Changing Face Of Canadian Television! The Changing Face Of Canadian Television! 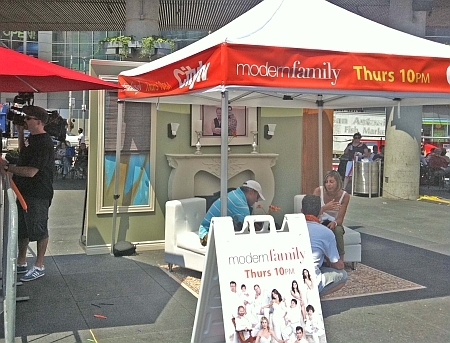 Posted: Thu Jun 02, 2011 5:27 am Post subject: The Changing Face Of Canadian Television! 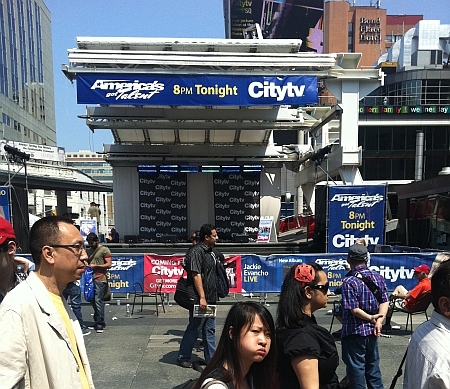 The City TV stage presentation at Yonge-Dundas Square! Toronto, Canada - May 31, 2011: The face of Canadian television is changing, from a Canadian centric base of homegrown programing to almost all American based programming. 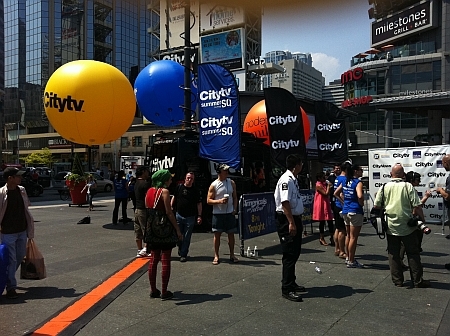 This trend can be seen at the TV broadcaster lineup promotions, City TV was at Yonge Dundas Square and Global Television was at an indoor venue. 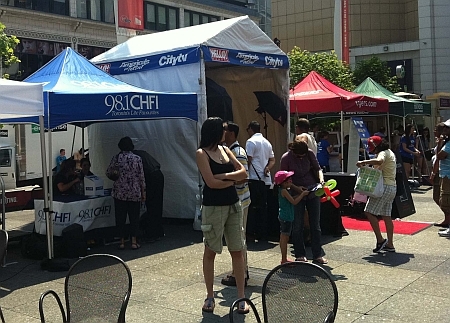 We had two reasons for being at Yonge-Dundas Square. One was that Maurice Ali (President of FOF RECORDS Inc./FOF Inc./MORE VISION Inc.) had a meeting with YDS management regarding our concert (FOFSTOCK - August 1, 2011 at Yonge-Dundas Square) and the second to report on the makeup of the latest batch of programing being broadcast to Canadian homes. 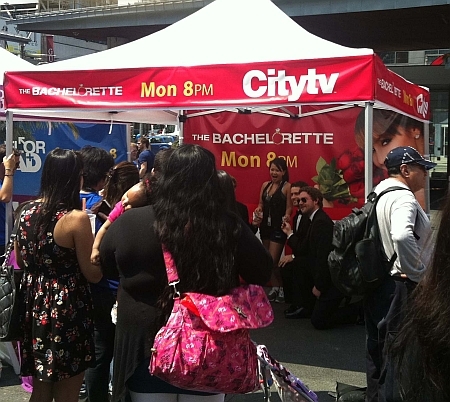 The tent for "The Bachelorette! 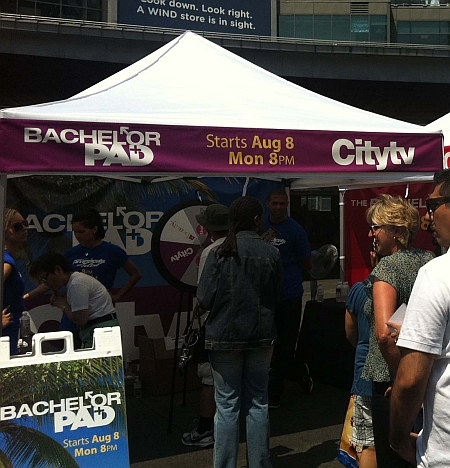 Take a look at the shows being marketed by City TV for example. Almost all are American programming. The most obvious being "America's Got Talent" along with "The Bachelor Pad" and the Bachelorette" and a few others. They were all located under individual tents for each show. The presentation for Modern Family! The mood was festive and open to the public but also had that unmistakable "corporate presentation" feel to the whole thing. The tent for "America's Got Talent"! 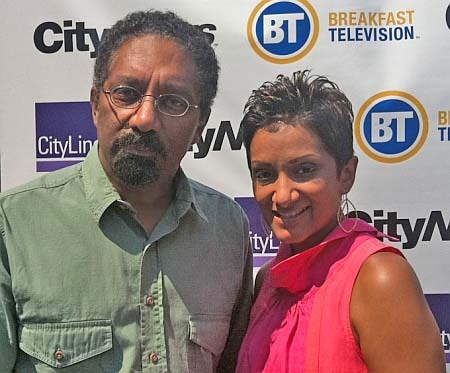 Maurice Ali with Natasha Ramsahai - City TV Meteorologist! "What you are seeing at this event, is what is happening at every major broadcaster lineup presentation, is the Americanizing of Canadian television. The reason is simple economics, scripted television shows are expensive and require large audiences for advertising money to pay for that programming in that time slot. With a fair chunk of advertising going to the Internet, the much smaller Canadian television industry is simply not capable of continuing to broadcast quality television as it could before. The result is playing American based television that still has the numbers to pay for quality production. Well what can be done is what we at FOF have been doing for the past seven years, producing quality local television content cheaply and supplying local news via citizen journalists and volunteers at journalist venues to disseminate local news. This has to be as Canadian broadcasting will inevitable become more national and international in news reporting and similarly in broadcasting of community events and entertainment. What we offer at FOF is a business plan that will provide local content to enable local talent access to the mass media at a cost that Canadian broadcaster can viably afford to transmit and turn a profit through advertising. Our example to the world is our own television series called "The Fortress Experiment" financed by ordinary people and with talent wholly obtained in a representative group found in any community. At this event this year, it is my hope that next year we will see more Canadian programming being promoted. Maybe our own Fortress Experiment, for example!" The presentation for "The Bachelor Pad! Yes, television is changing like all of broadcast media to a more international market. organizations like our own FOF have something to say about that. Only time will tell if broadcasters are willing to give this type of local based production a chance. A ballon display at Yonge-Dundas Square!